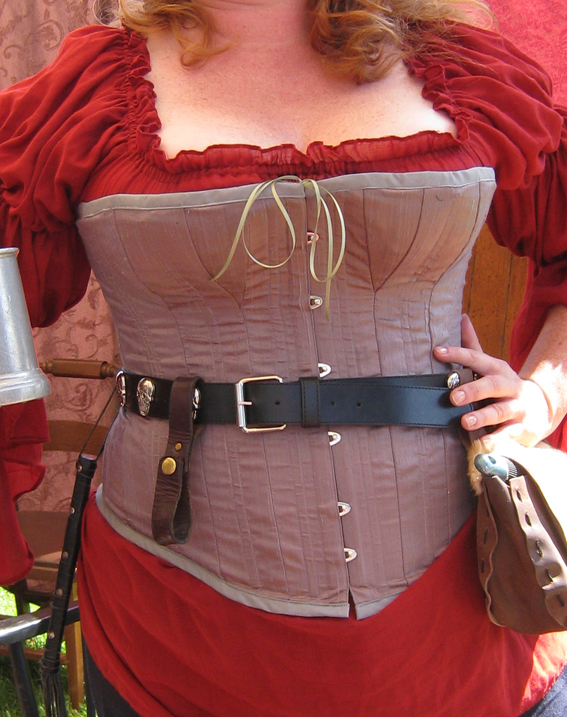 This is a corset I made for a friend to wear to a Pirate Faire where period is a little vague. Very vague, actually. The Golden Age of Piracy was over by the 1750s and this is a full late-Victorian corset with bust gussets. But no matter! She wanted a simple, yet elegant corset that was comfortable and could be worn… elsewhere. This is not my pattern, but came from the excellent LaughingMoon Mercantile, whose research and pattern drafting skills I very much appreciate. The corset is made of a grey-blue dupioni silk that has copper threads running along the warp (or possibly the weft – I don’t recall). The overall effect is primarily grey-blue with glints of copper in the sun. The pirate lass, who shall remain nameless, was very pleased with the fit and support of the finished corset (which took two full mock-ups to get right). Never overlook the squish factor in corset making or wearing. All images by The Rogues of Thread (bythebodkin.wordpress.com) and licensed under a Creative Commons Attribution-NonCommercial-ShareAlike 3.0 Unported License, unless specifically attributed elsewhere. 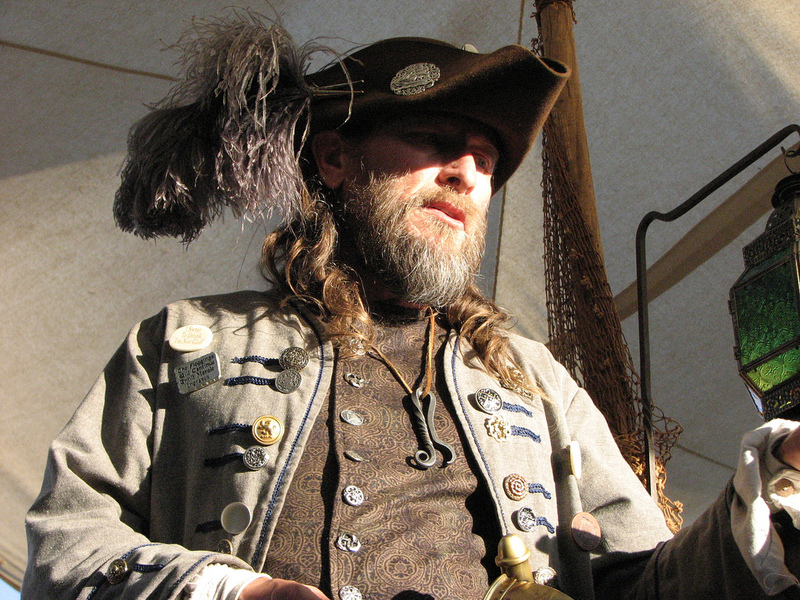 In 2005 we decided that our captain was looking a bit un-captain like, a bit lacking in that classic pirate look. As was our first mate. So we set about to surprise them and surprise them we did. 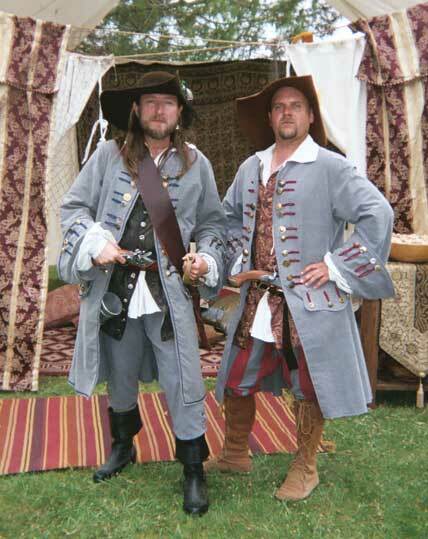 We created two full pirate costumes for the unsuspecting pair, wrapped them up in muslin and ribbon wrappings and presented the gifts. 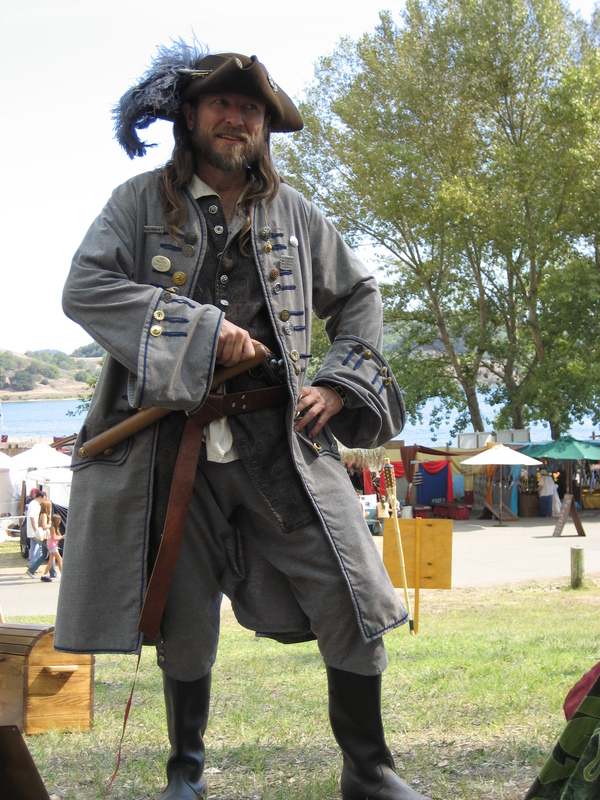 Their shock was gratifying, but seeing our captain, Winston Waters, still looking the well dressed pirate is more than thanks enough. This was our first costume collaboration!